Health Ministry Alert: immunization is recommended for all travelers 9 months of age and older. The US Centers for Disease Control report that there is a large, ongoing outbreak of yellow fever in multiple states of Brazil. Since early 2018, a number of unvaccinated travelers to Brazil contracted yellow fever; several have died. The outbreak of mosquito-transmitted yellow fever is no longer just a health alert and has become a real problem. Health officials are asking for intensification of the vaccine programs for yellow fever, so the recommendation is to get the vaccine before coming to Brazil. The vaccine should be included in the plans of visitors, without diminishing the use of other measures: repellent, mosquito net, insecticide, trousers and long sleeves, etc. The evolution is so rapid that the usual sources of information like the CDC or the travelers medicine websites are outdated. The news portals of Brazil follow the problem more closely. The area of Rio de Janeiro and Angra dos Reis, historical nautical destinations, have been particularly hard hit in recent days. Mortality in Angra is reported in 7 out of 12 cases. The overall mortality in the state of Rio de Janeiro is 45%. Due to the proximity of summer, the Ministry of Health issued a warning today (12 Nov) that populations living in areas where there is a recommendation for the yellow fever vaccine seek the dose in advance, before the period of major transmission of the disease - between December and March. 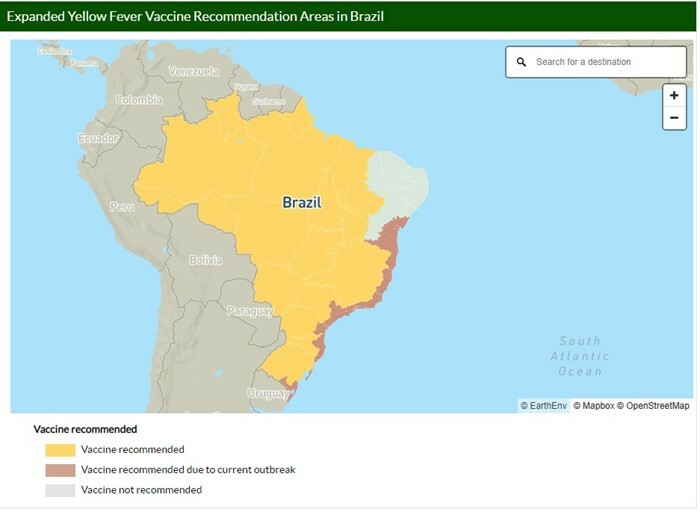 Localities that were recently affected by the virus and with a large population, such as the metropolitan areas of Rio de Janeiro, Minas Gerais and São Paulo, remain with a high number of people not immunized and at risk of becoming ill.
"The disease has a high lethality, around 40%, which makes the situation more serious," the ministry said in a statement. The goal of the alert is to avoid long lines in search of immunization. Vaccination coverage for yellow fever should be at least 95% of the population. Since the outbreak in December last year, vaccination against the disease has been expanded to reach 4,469 municipalities - including 940 cities located near the capitals and metropolitan areas of the Southeast and South regions, where there was evidence of viral circulation. The vaccine is offered in the National Vaccination Calendar and distributed monthly to the states. In 2018, according to the ministry, 30 million doses were sent to the entire country. "Despite this availability, there is a low population demand for vaccination. People should take the dose at least 10 days before moving to affected areas, "the ministry said. The target audience for vaccination against yellow fever includes people from 9 months of age and who do not have proof of vaccination. Since April 2017, Brazil has adopted the vaccine's single dose regimen, as recommended by the World Health Organization (WHO), supported by studies that ensure lifelong protection. Data indicate that between July 1 and November 8, 271 suspected cases of yellow fever were reported in humans, of which 150 were discarded, 120 remain under investigation and one was confirmed. In the same period, 1,079 epizootics were reported - death of non-human primates. "The data show the maintenance of viral circulation in the period of low occurrence (June to September), when low temperatures and rainfall generally imply conditions less conducive to transmission," the ministry said. The bulletin also confirms the first death from yellow fever in the second half of this year. The case was registered in São Paulo, with probable infection in the city of Caraguatatuba, where cases in monkeys had been detected months before the occurrence. Epizootics were also recorded in the states of Rio de Janeiro, Minas Gerais and Mato Grosso. Between July 1, 2017 and June 30 of this year, 1,376 cases of yellow fever in the country were reported and 483 deaths were confirmed. In total, 7,518 suspected cases were reported, of which 5,364 were discarded and 778 were still under investigation. Since the beginning of the year (January 1 to November 8), 1,311 cases of yellow fever in the country and 450 deaths have been confirmed. In the same period last year, 795 cases and 262 deaths were reported. Thanks to Dr. Omar Sanchez Wetdoc & PO Silvio P. Ramos for alerting the Ocean Cruising Club to this important information.